Battle weary British soldiers huddled beneath a fiery, smoke-filled sky, fearful that the German advance would not cause their annihilation. The British army was led by General Viscount Gort. The Germans relentlessly pushed forward, trapping the men between them and the English Channel. The French and Belgian troops had joined with them as they waited at the small port of Dunkirk France. Vice admiral, Bertram Ramsay was planning a strategy to evacuate the troops. There were over two hundred thousand British soldiers and he deduced that perhaps only twenty or thirty thousand had a chance to be rescued. The power of prayer kicked in with the king and queen kneeling at Westminster Alley. The archbishop of Canter bury, the prime minister and all of Parliament followed suit and went to their knees in prayer! Ramsay made a public call for help, asking anyone at all who was able to rescue the troops with any kind of boat to do so. For reasons still not known, on May 24, 1940 Hitler ordered his ranks to retreat from pursuing the retreating allied force. Thus entered a parenthetical pause beginning the opening scene of one of the most miraculous events in recorded history! Miraculously, private yachts, fishing and boy scout boats, barge operators and tugboat captains responded! Men who were being rescued also prayed and by the prayers of a nation a miracle was unfolded each hour. Nine days later, 338,226 people had been rescued! Besides the whole nation of England praying, the whole world united in prayer. President Franklin Roosevelt issued a proclamation for prayer and all responded. I’ve never been interested in wars, stories of battles or the military, but as a servant and soldier of the most high God throughout my thirty years, I’ve taken a great interest in the successful strategies of the great biblical warriors and generals of the Bible, such as Joshua, King David and Gideon. The strategies of earthly, secular battles are no different from the unseen wars in heaven where God’s angels duke it out with demons. I rejoiced upon reading the astounding account of the evacuation at Dunkirk, France, in Chapter 17 of Peggy Ruth Joyce’s powerful book, Psalm 91. I’m reminded of the faithfulness of God, who when He occupies our faith-filled thoughts, he will help us to recover and occupy the areas the enemy has conquered. This account of at Dunkirk, France and the its supernatural consequences prove to me that God who answered all the unified prayers of these involved is still the same God today. Today is National Day of Prayer. During my morning devotion and communion time with Abba, I started weeping and praying for America. Last night, I tuned into the Jim Bakker show. Rabbi Jonathan Cahn talked bout his book, “The Harbinger” a national best-seller and prophetic warning to America. He told us that God was very angry with America for the slaughtering of the unborn. Pastor Bakker’s wife Lori, was overseeing the construction of Lor’i’s house, a home for pregnant mothers who choose to carry their babies to term. A small minority of protestors are trying to impede this precious ministry, showing us that satan does not want life, but death. Before I shut out my lights to retire, my last thoughts were about satan’s insidious cancer of sin and murder that prevails our once Godly and blessed nation. Our leaders are calling evil, good and good, evil. One, small woman, named Madeline Murray O’ Hare had such audacity that she opposed everything Christian and set forth on her demonic crusade to get prayer banned from schools! I’m astounded at her tenacity and focus to get her job done! One woman! We are a body of… how many Spirit-filled Christians? 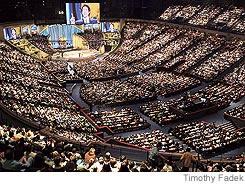 Joel Osteen and Joyce Meyer services and crusades boast packed stadiums! With that many people, why are babies still being butchered and our Christian values being reneged? America continued on her downward spiral with the landmark decision Roe Vs Wade by the United States Supreme Court on the issue of abortion, Pandora’s box of infectious sin has taken its course. America languishes in the same place as those stranded thousands of soldiers under the threat of ambush. Some of us are sleepy and dull. Some of us are too concerned about our worldly distractions to take time to pray or to even check whats going on in our land. Some of us haven’t voted in years. ‘Some of us have no idea what bills have been passed regarding the taking of our Christian liberties and some of us don’t even care! So…what are we going to do about it? We had better be about the father’s business. defending the rights of the orphans, widows and defenseless: the unborn. Time is short. God gave us a warning on 9/11. Let’s change direction…fast!